On Saturday, September 27 the Communist Party (KPU) had called a “March for Peace”. The call was banned by the authorities and the rally was attacked by fascist thugs. 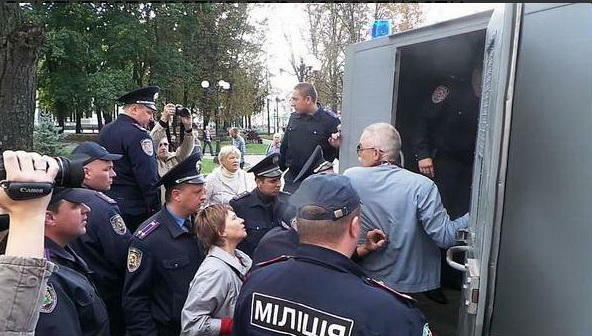 The police then proceeded to arrest dozens of protesters, including the first secretary of the Kharkov KPU Alla Alexander. This means that anyone who is in opposition to the war in the Donbass is in fact considered an “enemy of Ukraine” and his or her political rights can therefore be violated by the state with total impunity. 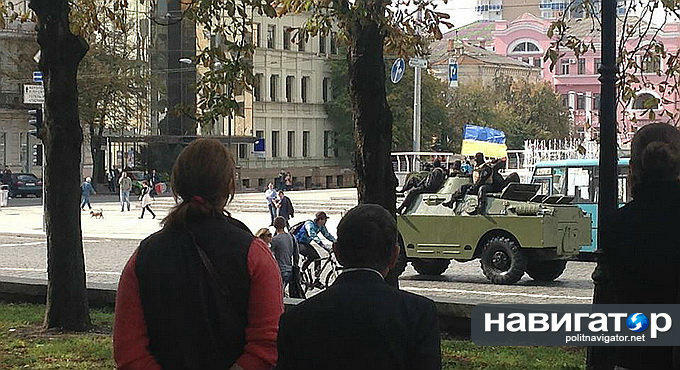 As well as a coordinated attack on the demonstration by fascist thugs, armoured army vehicles patrolled the city waving Ukrainian flags in a provocative way. Then the police physically prevented the assembled crowd from marching and arrested 23 of them, bundling them into a bus. Of course, the day after, the police and the national guard allowed and protected a “Ukraine unity” march to go ahead, which ended in the destruction of Lenin’s statue by fascist thugs. Many of them were masked and carrying weapons, as well as using neo-nazi symbols and those of the Ukrainian Insurgent Army (UPA), which collaborated with the nazis in WWII and carried out a genocide of the Poles in Western Ukraine. At the forefront of the crowd overthrowing the statue were militants of the neo-nazi Social-Nationalist Assembly and Azov Regiment, as well as those from far-right Svoboda party. The action was cheered by Interior Minister Arsen Avakov. On October 14, the anniversary of the foundation of the Ukrainian Insurgent Army, a traditional day of neo-nazi agitation, the fascists are calling for a demonstration in Kharkov which could be the scenario of further provocations. This entry was posted in News and tagged Arsen avakov, azov, Communist Party, kharkiv, Kharkov, KPU, Lenin, statue. Bookmark the permalink.